Have a look at that beauty. That could be Sydney. Everyone can have cheap, spacious apartments close to work. Chinese investors are tripping over each other to give us their money to invest in infrastructure and housing, consortiums have drawn up ambitious plans – a $100Bn redevelopment of inner Sydney. We must build up. And yet the parasitic politicians will not allow it. I, like 5 million other Australians live in a very overpopulated city with not enough housing nor infrastructure, most accommodation amounts to overpriced cockroach infested shoeboxes. One would think something should be done about this, yet only in Australia can there be consumer demand, investor money, plans to do what is long overdue, what makes complete and perfect sense – and for all of it to never get off the ground, because of our worthless politicians are hell bent on stopping the free market from delivering prosperity to the people. 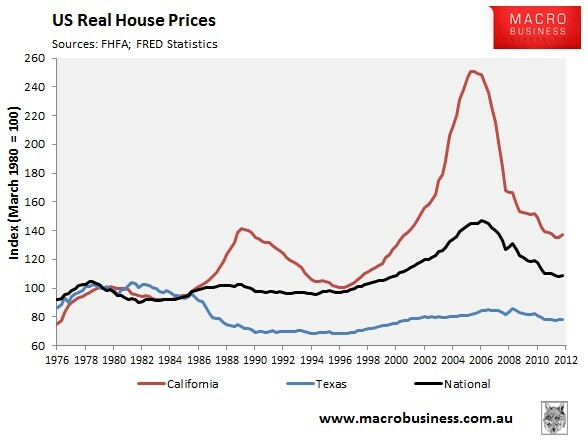 Despite having significantly higher population growth than California, Texas has delivered stable house prices without bubbles, keeping both housing costs and housing related taxes considerably lower than California. 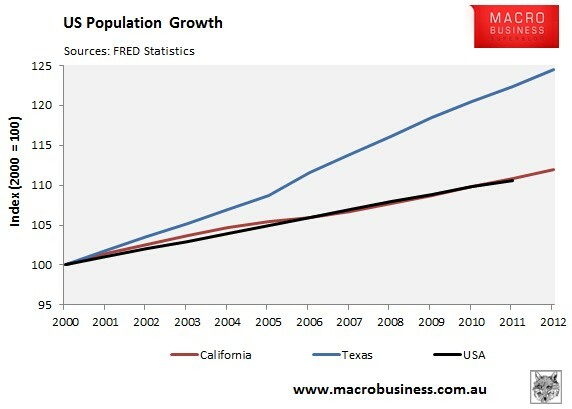 Keep in mind, California is essentially the same as UK/Australia in terms of land use and planning (over)regulations, and as such everyone should basically model land regulations, infrastructure provisioning, and in general everything to do with housing on the Texas model. 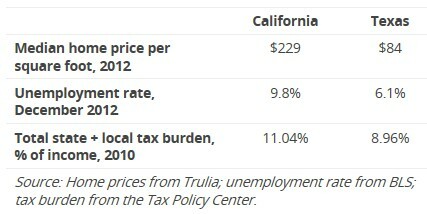 Now if only politicians could get their heads out of their asses and move on this most obvious data. Jim Richards – the smartest man alive (or one thereof) gave a great Interview on ABC’s The Business, and because it doesn’t appear as though you can embed videos, click here to view it. The best economics journalists in Australia bring you….the Spriukbot Telephunken U-47! This is an article about the UK, but it is clearly even more applicable to Australia – especially since our parasitic real-estate industry is lobbying our government to do exactly the same as the UK has maliciously done. 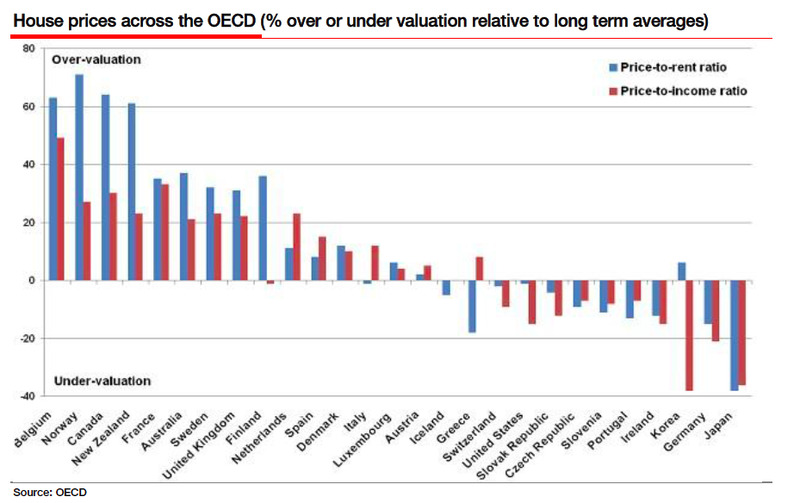 I wonder how much higher that will rise once the AUD falls, inflation rises and real incomes plummet?